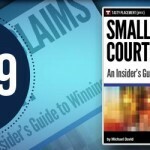 What follows is a brief but informative summary of rules, procedures, and filings requirements for small claims court in Alabama. Keep in mind that rules and laws change. It’s always a good idea to confirm the rules with the court or with further research. Maximum Jurisdictional Dollar Amount: The maximum dollar amount is $3,000. Where Suit May Be Brought: Case may be brought where the defendant resides, or injury or property damage occurred. A corporation is deemed to reside where it does business. Proper Manner of Service of Process upon Defendant: Service may be made by certified mail, sheriff or court-approved adult. Attorney Representation Rule: Attorneys are allowed, and are required for assignees (collection agencies). Special Provisions Regarding Transfer or Jurisdiction of Cases: There is no provision. Availability of Appeals: Either litigant may appeal for a new trial to Circuit Court within 14 days. Special Rules and Notes: Injunctive relief is available. Defendant must answer within 14 days or lose by default. Small Claims Court cannot hear eviction cases.